In this issue, our guest interviewed for the American Dream profile is Pastor Silvani DaSilva of the Assembly of God Church in Danbury. He shares a little bit of his journey in the United States, the challenges and the love and admiration he has for the country that has embraced him. Born in a small town in the state of Minas Gerais, Brazil, Silvani DaSilva moved to Sao Paulo with his family at age of 10. He lived there until he was 28 years old, when he decided to come to the United States with his wife in pursuit of their dreams. “I got married in 1989 and have always had a desire to come here, which I did as soon as my wife, Dejane Ferreira, and I got our tourist visa. We arrived in February of that year,” he recalls. It was winter, he remembers, and he did not speak English. He had only a cousin, who allowed them to live with him until they could find a place to live. That was the beginning of his journey. The years passed by and with their move to the United States, they decided to stop trying to have children again. Nevertheless, after a while, they realized there were more resources available here and tried once again to have a baby. “Some doctors said that she would not go above 10 lbs., that she had a developmental condition and we would probably lose her. Seven years have passed… now, she weighs 42 lbs. ; she does not speak or walk yet, but understands everything that we say. She can express a few things. 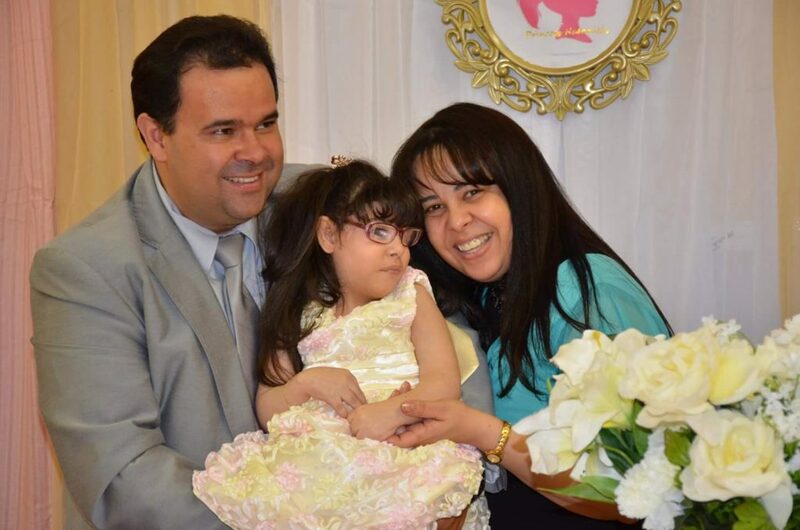 She attends a special school, and specialist doctors assist her. She is gradually developing, one day at a time, growing and becoming more active. My daughter’s life is a true miracle,” he emphasizes. From a Christian family, Pr. DaSilva, since he was a child, felt the call to preach, minister and lead a church. “I was baptized in the Assembly of God Church at 14, and have, since then, dedicated my life to preaching the Gospel and Bible study. I became a presbyter in Brazil, which is a minister of the second order in the church’s hierarchy. I assisted a pastor, and I came to America under the same title with a letter giving me permission to move here. My life as a minister started to develop more at that point. I became an evangelist in 2004, and was prepared for ministry,” he explains. For Pr. DaSilva, the United States is more than a homeland. It is an embracing country in which people are treated with dignity. “I was able to have things here that I didn’t have an opportunity to achieve in Brazil. I had no money to buy a bag of popcorn sold at the train station. Today, to be here, as an American citizen, speaking English and living the American dream, this is not mine; it is God’s,” he concludes.